Sometimes, you just need to fry something. And in the case of this particular week? That something was chicken. Not your traditional bone-in, skin-on chicken – but a well-breaded chicken cutlet, just the right size to plop into the middle of a honey-ed, hot-sauced-ed, delightfully buttery biscuit. 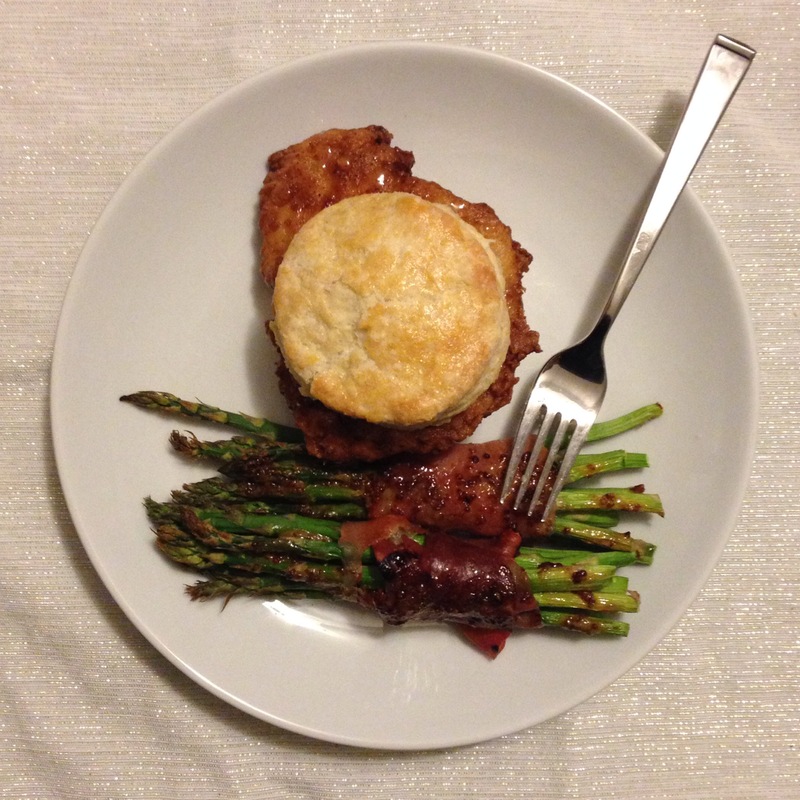 Don’t get me wrong, the whole thing was a little involved for a Tuesday night… but despite having a lot of steps and about a million dirtied bowls and utensils, making these fried chicken biscuits doesn’t take ALL that long – and regardless, they’re totally worth it! *you want the chicken to be about 2 pounds total. I like to buy the “thin sliced” chicken breast at Trader Joe’s, but you can also take regular chicken breasts and butterfly them (some of those things are monsters, and you’d be able to get 3 thin pieces out of each breast). I have another dish planned for later in the week that requires chopped up chicken breast, so I also trimmed a couple inches off the end of each piece of chicken, so they’d be ever so slightly more biscuit-sized, rather than having 4″ of chicken hanging off the side. Proceed as you see fit. 1.) 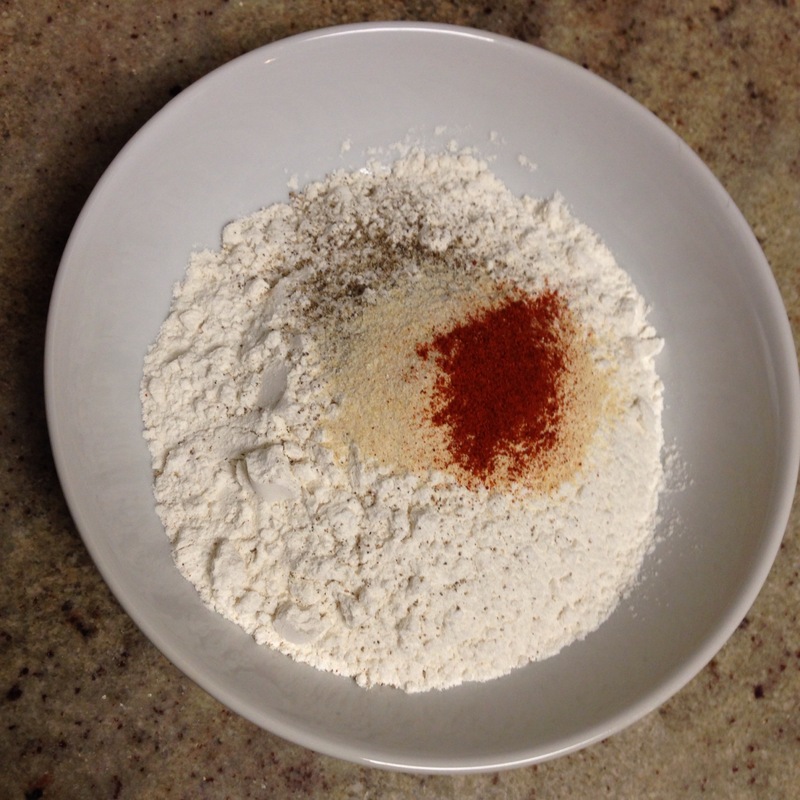 In a large ziploc bag, combine one cup of buttermilk, one tablespoon of hot sauce, half a teaspoon each of kosher salt and pepper, one quarter teaspoon of cayenne pepper, and the crushed garlic. Add the chicken, squeeze the excess air from the bag, seal it, and move everything around until the chicken is coated well. At this point, you can let the chicken marinate in the fridge for a couple hours (up to 8); or, if you’re short on time, just leave the chicken in the marinade while you prep and bake the biscuits. 4.) 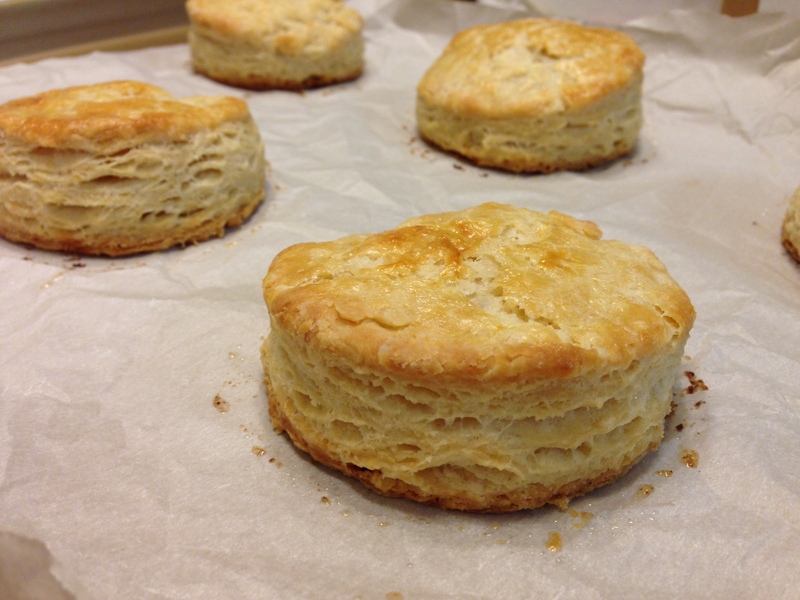 Use a 2.5″ biscuit cutter to cut rounds from the dough. Re-roll scraps once, and cut more biscuits. Place the biscuits on a parchment or silpat-lined baking sheet, brush the tops with the beaten egg, and bake for about 20 minutes, until they’re golden brown. 5.) While the biscuits bake, you can work on your chicken! Place a large skillet (preferably cast-iron, 10-12″) over heat set at slightly above medium. 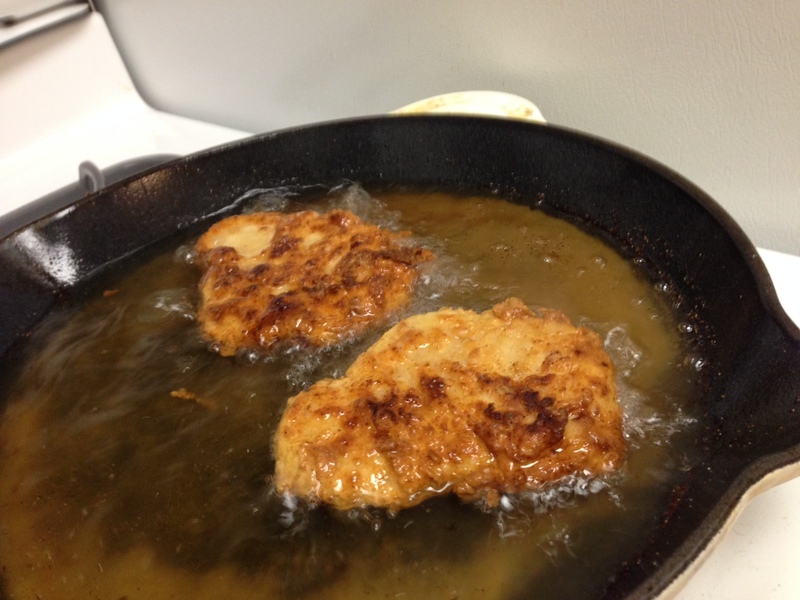 Fill the skillet with oil to about 1/2″ depth; it will take about 10-15 minutes to come up to temp for frying. 6.) Set up your breading station for the chicken. Set out two shallow bowls; in one, pour one cup of buttermilk, and in the other, whisk together a cup and a half of flour, one teaspoon each of kosher salt, garlic powder, and onion powder, and half a teaspoon each of black pepper and cayenne pepper. 7.) Remove the chicken from the marinade, and let any excess buttermilk drip off. 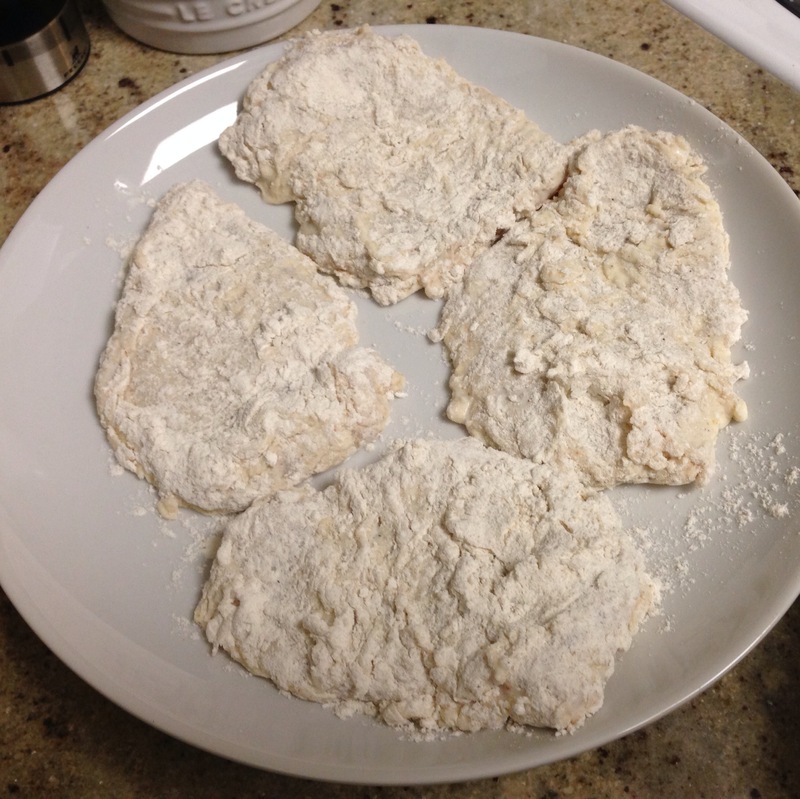 Immediately dredge each piece in the seasoned flour, being sure to coat them well. 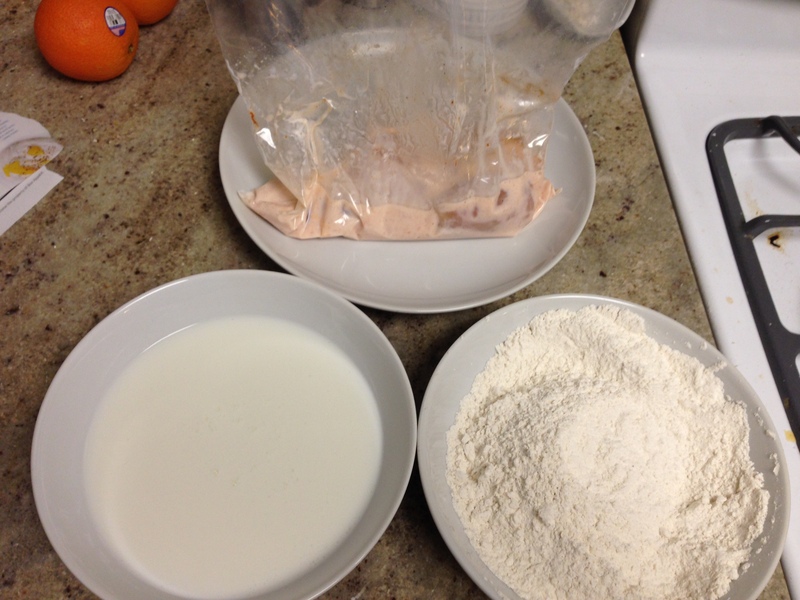 Then, dip each piece back into the buttermilk, and then back into the flour, for a second coating. This double coating of buttermilk and seasoned flour is what helps give the chicken a nice, crispy coating, without any skin! 8.) When all your chicken is breaded and ready to fry, your oil should be ready. You can use a candy thermometer to check the temperature – it should be about 360°. 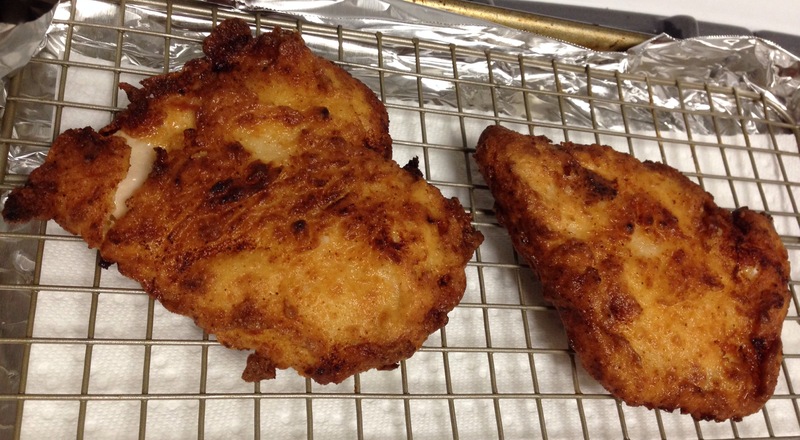 If you don’t have a candy thermometer, throw some panko bread crumbs or a small piece of bread into the oil – it should bubble pretty vigorously around the bread, and take a minute or so to turn golden brown. 9.) Add the chicken, a couple pieces at a time, to the pan (being sure to lay them into the oil so that the last end to go in faces away from you, in case of splattering). Be sure not to overcrowd the pan; I like to fry 2-3 pieces at a time. Fry for 3-4 minutes per side, until they’re golden brown. Once they’re done cooking, remove them to a baking sheet lined with foil, paper-towel, and a baking rack; this will allow them to drain any excess oil (and can be thrown into a 200° oven to keep warm while you finish frying, if needed). 10.) 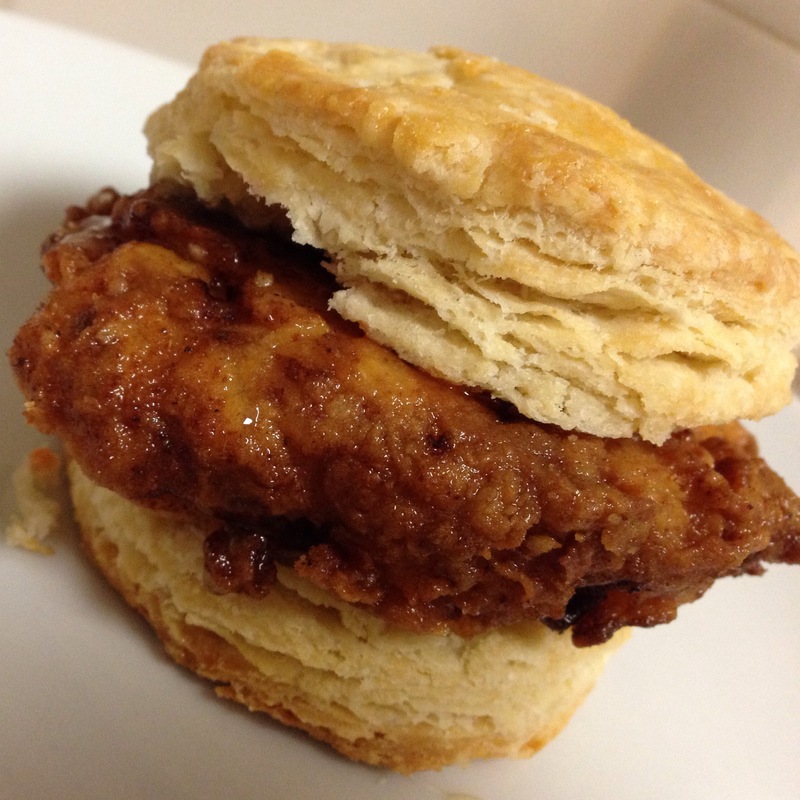 When your biscuits are baked and your chicken is fried, it’s time for sandwich assembly. Split each biscuit in half, and spread both sides with butter and hot sauce (as much or as little as you like). 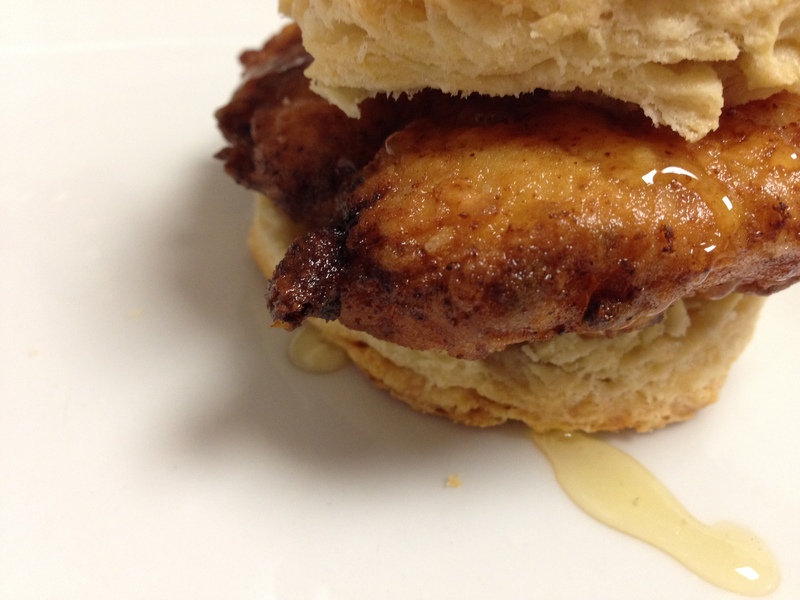 Add a piece of chicken to each biscuit, drizzle it with honey, then add the top of the biscuit. Serve immediately. I mean… what really needs to be said here? 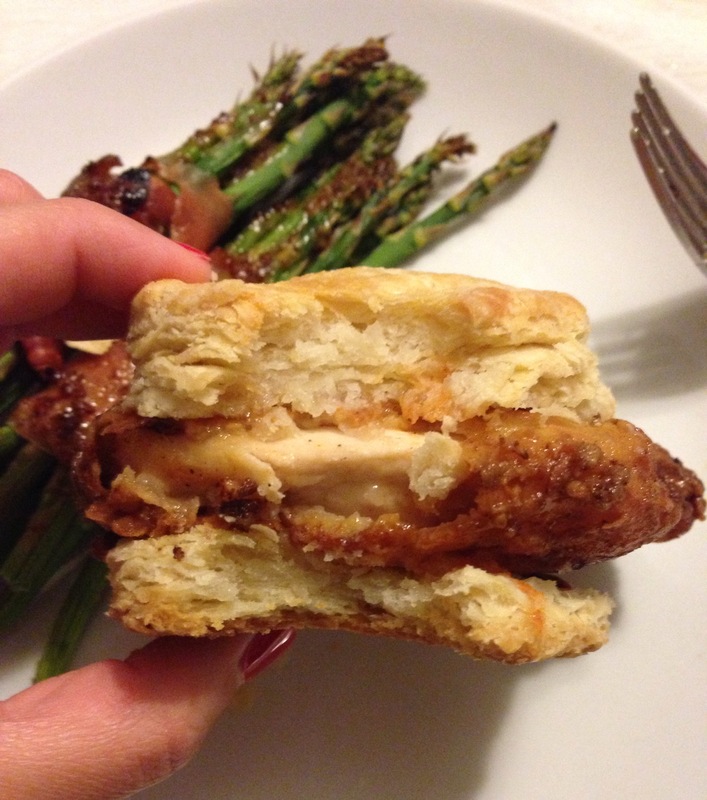 Do I really need to convince you that a buttery, flaky biscuit topped with hot, crispy chicken, and dripping with honey and hot sauce, will be amazingly delicious? If you need convincing, then I am not sure we should be friends, quite frankly. Yeah, these sandwiches are awesome. Really, really awesome. The buttermilk marinade keeps the chicken super moist, and the double-dip in very well seasoned flour gives the coating a great amount of flavor and spice. Add in the acidic edge of hot sauce, the subtle sweetness of the honey, the buttery richness of the biscuit… what I’m saying is, it’s a damn good thing I hate to fry stuff, or I’d be making these daily, and then I’d need much, much larger pants. It would probably be worth it. did daniel think he hit the lottery? He got stuck at work late, and I received a desperate text around 6:30, saying “I want fried chicken biscuits soooooo bad”… needless to say, he was pleased!